Join Maui the Demigod as he sets sail on a journey of a lifetime. Meet Maui, the greatest Demigod in all of the Pacific Islands. 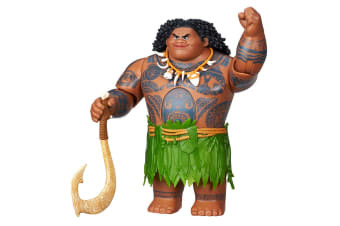 Equipped with his magical fish hook, Maui the Demigod embarks on an important journey of self-discovery alongside Moana of Oceania, bringing him super strength, as well as his super-sized personality! The Disney Moana Maui the Demigod Action Figure says 10 key phrases from Disney’s Moana, and also features fish hook swinging action! Twist Maui’s body and then release to see his arm swing about. With many movable parts, set sail and go on endless adventures with Maui the Demigod.